The Umbrella Academy: Hotel Oblivion #2 Review – AiPT! Great insight into the mindset and the misery of The Rumor. 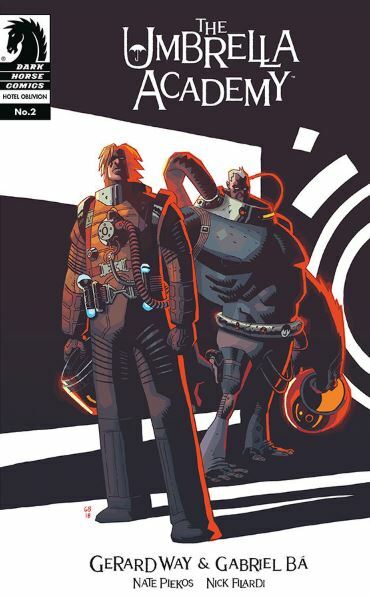 The Umbrella Academy: Hotel Oblivion issue #1 was the big re-introduction after a long break. How does this issue fare as a follow-up? Hotel Oblivion #2 starts off with one of the notable absences from #1 as it reveals where The Seance is and just what he’s doing. It clearly defines his mental state and gives a teaser of what is to come in the future. What it actually means is something that we will probably find out much later on. For most of the core characters we only get a fleeting glimpse of them in this issue — for some, their scenes are focused on furthering their piece of the plot or providing a change of pace. But for others, like Vanya, it continues to establish their mood and show how their upbringing affected the children. The core of this issue is The Rumor. It’s sad to see her behaviour here, clinging to the past via routine despite it being obvious that it helps no one. In fact, so much of this issue focuses on misery, sadness and self-destruction where the Umbrella Academy are concerned. This is even more central to the issue since the plot is currently obscured due to the scattered narrative. Issue #2 of Hotel Oblivion is very similar to the first issue in structure. We get to see a little bit from everyone, enough to whet the appetite but, with the exception of The Seance and The Rumor, we don’t get more than that. We get more pieces of the puzzle here but not enough to clearly see the bigger picture and how things fit together. So far Hotel Oblivion is giving you just enough to let you make wild guesses, and not much more. That’s fine for now, but I do hope that things become a little clearer in the next issue. It would be nice to have a little more focus so it feels like there is a little more substance and progress. Gabriel Ba’s artwork is great. The backgrounds capture the world of Umbrella Academy and his use of body language is really good here. The two highlights for me are the introduction to The Seance and the scene where he uses his powers. Nick Filardi’s colors deserve a lot of praise as well. The story is broken down into many different scenes with varying tones or environments and each color palette that Filardi uses is great at capturing the mood or the feel. Despite that variety Filardi manages to make them feel consistent, in part due to his distinctive use of colors with shadows and lighting. The shadows in the last few panels really add to the mood of that scene. Ultimately, Umbrella Academy: Hotel Oblivion #2 provides great insight into the mindset and the misery of The Rumor and it fills us in on the life of The Seance. We get a lot of intrigue and some great artwork but the structure makes it feel like we’re not making any progress. Umbrella Academy: Hotel Oblivion #2 provides great insight into the mindset and the misery of The Rumor and it fills us in on the life of The Seance. We get a lot of intrigue and some great artwork but the structure makes it feel like we're not making any progress.